Q: Do you hire out just the aerial drone? A: Unfortunately not it would need to be operated by a trained pilot who is insured and registered for the aircraft. 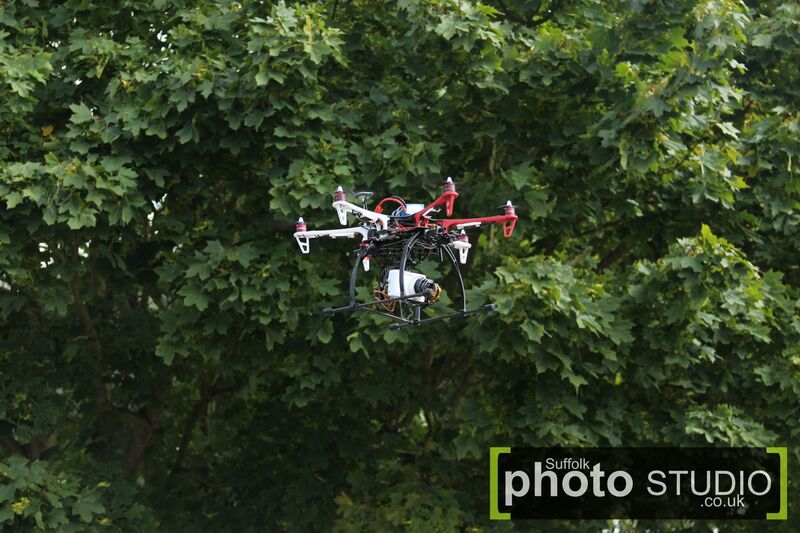 The multicopter is an expensive item and with the dangers and regulations involved with flights and height restrictions we would want to keep this to our own pilots giving you the best images. Q: Does your Multicam fly in rain? A: No, we would not want to risk the electronics, we are working on a waterproof drone however the camera may still have rain drops. We could make the opionion ourselves on the day as it has been flown in very light misty drizzle without problem whilst keeping the high quality of film and picture. Q: How does wind effect Helicam? A: Winds above 15mph makes it difficult to create smooth and steady shots. The easier flight the better the image however hard the gimbal has to work the less flight time and less movement for smooth adjustment we have. Q: What is the maximum speed? A: We believe the be able to travel up to speeds around 20mph. This does mean however it is harder to fly over distance unless the pilot is also travelling behind the multicopter. Q: Is it safe to fly on top of actors / crowd? A: Safety is our main priority and we NEVER fly over an audience or crowd or where persons maybe not aware of what is happening where we do not have specific emergency procedures. Most of the time however we are able to fly next to actors/ audiences, building or cars with a clear flight line and make it look like we are over them. Q: Can you fly inside? A: Yes, providing the area inside is big enough, we have done this inside large concert halls and churchs take a look at the gallery. 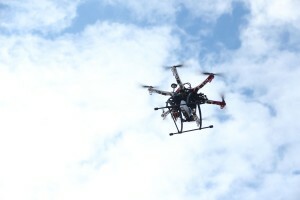 Q: Is flying a helicam safe? A: We do try to make it as safe as possible. As soon as we are site we access and look at the risks, multicopter can have problems so we plan for this, we have very strict safety measures in place and every aircraft is flight tested by an inspector before it commences operation. Along site this we have onboard safety measures and at the flick of a switch the helicam will come “home” and land by its self. The same goes should the batteries run low or we loose communication with it. Q: What is the maximum operating distance for helicam? A: By law we have to be able to see helicam, so there has to be always uninterrupted line of sight between pilot and helicam. The maximum radius we can fly away from us is 500m (although we can use a vehicle to fly from to extend the range). We are also limited to 400ft in height; however it is sometimes possible to get permission to fly higher from the Civil Aviation Authority. Q: Can we use our own camera for helicam? A: Yes, we do have a small UAV that you can attach your own camera or use ours. This will operate up to 400grams however heavy the camera shorter the flight time. Depending on camera will mean the live link may not work as well. Q: How do you know the shot is right? A: We have a live stream down to a monitor which enables you to ensure framing is correct, if the camera has a screen on the back we can wire a live view down to see the back of the camera as well or to see the angle of the camera. Q: Can you control the camera from the ground? A: Yes, we can remote control the tilt and always turn the drone to capture the best shot. The gimbal is brushless so is completely smooth video. On some cameras we can control the zoom – please ask for info on this. 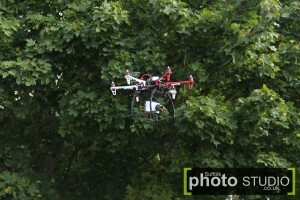 Q: Can the wireless video from the helicam used for live broadcast? A: Under normal operation we do not do this. If you really do require this then we can send an analogue signal to the ground which could be used. Q: Can i buy a helicam from you? A: Yes you can; we offer 3 types of aerial filming helicam. The first is suited to the beginner and will carry a Go Pro camera, the 2nd model is suited to a Panasonic GH2 and the 3rd system is our heavy lift Octo which will carry a payload comfortably of about 3.2kg. Contact us for more details.